As technology made exponential increases in the quality of visuals and sound in gaming, one title in particular made full use of early 90’s computing power. 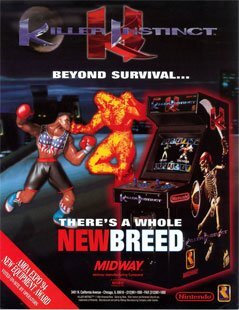 This tech goliath was none other than Killer Instinct, the hyper-stylised tour-de-force arcade brawler. The aggressive inflection of the commentator, the visceral, rendered graphics, and the highly enjoyable and satisfying combo system are just some of the features that made Killer Instinct a mainstay at arcades across the globe. Killer Instinct was the sign of evolution. Everything in the game attempted to build on what came before it, creating new experiences that are bigger, better and more insane. For the most part, mission accomplished! While the game has not created the legacy on par with Street Fighter or Mortal Kombat, Killer Instinct brought a new-found interest in gaming amongst many who happened to walk past the arcade unit and revel at the iconic sounds, stylised visuals and excellent character design the title brought. To its credit, no one had ever seen anything like this game before, and it may have been the first fighter to truly convey a sense of power as you take control of your character. Each strike felt real, being buoyed by some of the greatest sound effects ever witnessed in gaming. In SF, it is hard to get a sense of how strong the punches and kicks are, while Killer Instinct truly brings the pain, making many gamers unintentionally cringe as their character is meleed into submission by an opponent. It is this visceral environment and unflinching kinetic violence that turned Killer Instinct into a legendary title. In KI, you compete as a fighter in a tournament held by a megacorp known as Ultratech, who wants to test the effectiveness of some of the experimental creatures/weapons they have been developing. Taking on the role of a skilled brawler, you must take out many challengers on your rise to the top. Only then will your character get what he or she is looking for, be it money, answers, freedom, or revenge. But lets get serious, most played to attempt greatness and dominate their opponents by using the over-the-top combo system. Few games were ever able to create the atmosphere Killer Instinct was able to achieve, and in its heyday, the fervour was palpable, with large groups of ravenous fans crowding around the arcade unit, going hyperbolic as the aggressive player attempts to unleash an Ultra Combo, while the competitor waits for the perfect time to bust out a momentum-shifting Combo Breaker. It can be said that games like League of Legends and Dota 2 have advanced the use of audio during big moments, they still pale in comparison to the pivotal seconds during a Killer Instinct match when momentum shifts and a big move is executed. Chief Thunder - Tomahawk wielding Chief looking for his brother who went missing in the last tourney. Cinder - Former criminal turned into a human torch after chemical weapons research, Cinder must defeat Glacius in order to return to his original form. Fulgore - A badass cyborg developed by Ultratech, enters the tourney to test its fighting ability. Jago - This Tibetan monk, an expert in the Tiger Spirit, believes it is his destiny to take down Ultratech. T.J. Combo - An American Boxer who wants his title back after it was found he used cybernetic implants. Sabrewolf - Count Von Sabrewulf is a wealthy noble with a case of lycanthropy who needs a cure. Spinal - Fighting for vengeance and freedom, Spinal is a skeleton equipped with a sword and shield. Eyedol - The final boss, this two-headed ancient warlord was trapped in a dimensional maximum security prison until Ultratech let him out on the condition that he defeat the last competitor standing. Beat the final boss and you win. Unfortunately this “win” was officially sanctioned by an evil megacorp, so in the long run, you will probably lose. And this, kids, is why sequels exist. With a new version of the game being released with the launch of the Xbox One, Killer Instinct has proven it was, and still is, and extremely influential and loved part of the arcade space. Now we can continue those Ultra-Combo’s into the brave new world of gaming.